Newsletters, emails, marketing material, webpages, blog posts, brand stories, social media posts, chatbot scripts, resources… there are many things that you COULD be writing for your business. And in time, you will probably get around to writing them all. But right now, you need to focus on the basics. Don’t let the sheer volume of written content needed paralyse you from writing anything at all. You simply need to clear the decks and focus on the parts that are most important first. 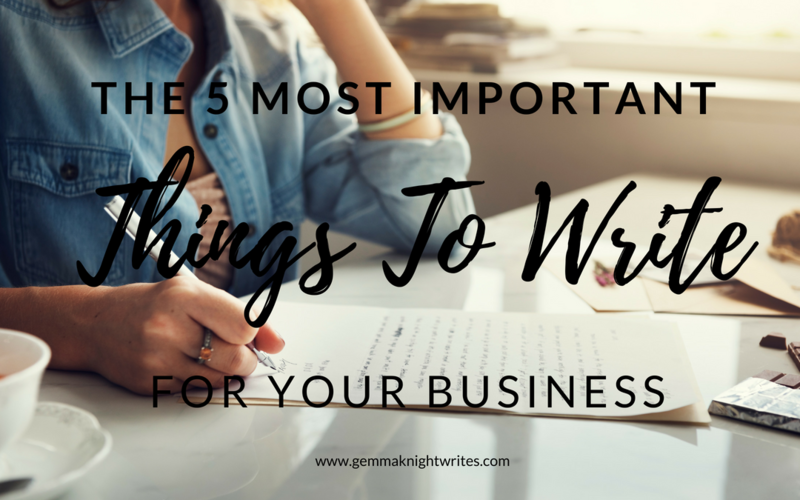 There are 5 vitally important things to write for your business. You should focus on creating quality in these areas first. Once those 5 pieces are done, then you can tackle the other aspects. Without a doubt, your website is where you should focus your written energies first. It is where people will go to find out more about your business. If they don’t find the info they need, or it is not a good representation of you, they will navigate away and you will lose their business. The three main areas to focus on are the Home and About Pages, and your Product/Service descriptions. Remember that your Homepage has to introduce your business in a concise and compelling way. And your About Page should tell your business story, the problems you solve, and how you can help through the eyes of your ideal client. Your Product and Service descriptions should focus on the benefits of your offerings as well as the features. You do not have to create a weekly post for your blog to be a success. Instead, focus on creating two or three pieces of cornerstone content that you can reshare and repurpose. The topics for these articles should demonstrate your industry expertise and be really valuable to your ideal client. For some ideas, maybe try answering a meaty question that you get asked all the time, or explain the solution to your client’s biggest problem. Don’t forget to include a Call to Action at the end of these blog posts. My recommendation would be to get them on your email list with a freebie offer, or a product discount. People are starting to get very savvy and will not simply hand over their email addresses for a newsletter sign up. You need to give them something that is worth their while. A lead magnet is a really good way to entice them to your list. Produce a great resource that encourages them to join your list, and the opt-in page to go along with it. Try a tip sheet, how to guide, checklist, template, product discount etc. Whatever you choose, make sure you use compelling copy to entice your ideal client, with a killer headline to hook them in. A lead magnet is often the first engagement you have with a potential client or customer, so make sure the content is as good as your paid content would be. If people have joined your list via your lead magnet or CTA then they might not know much about your business. Your welcome sequence can introduce you, what you can do, and the problems that your business solves. It begins a relationship of trust and puts you in a good position to ask for the sale when the time is right. But in order to ask for that sale, your subscribers need to Know, Like and Trust your business. Your welcome sequence should be between 3 and 7 emails long and should share your best information and resources. Less than 5% of people are ready to buy from you on the first encounter they have with your business. Popping into their inbox every week, fortnight, or month is a great way to remind potential clients that your business still exists. If you provide them with lots of interesting and valuable content, then you are proving your expertise and that you really do know what you are talking about. It helps to convince your newsletter subscribers that you are worthy of their hard earned dollars! Creating these 5 pieces of business content will really build a solid platform for you to market your services from. Once you have these bits nailed, you can move onto creating other supplementary content also. Finding the time to write any content can be hard. Sometimes your time can be better spent focusing on the key parts of your business. If you are pressed for time and don’t have these 5 things in place for your business, I can help you create them. Get in touch with me on hello@gemmaknightwrites.com to discuss getting these 5 keys content pieces in place for your business.